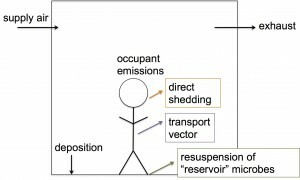 Breaking down human emissions – microBEnet: the microbiology of the Built Environment network. Microbiology of the Built Environment research these recent years have explored how humans are a source of microbes and microbial products indoors. To further study the effect of human occupancy on the biological aerosols of indoor space, our research group at Berkeley decided to move from observation studies to controlled experiments to isolate – and quantify – this human input. 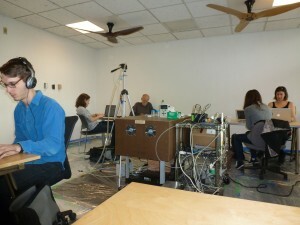 So, we utilized the Controlled Environmental Chamber (a conference-room like environment; see picture) within the Center For the Built Environment to do a particle- and biological-based assessment of the effect of occupancy on bioaerosols. For our experiment, we varied the number and activity level of occupants in the chamber. We collected particles for genetic analysis, and we also monitored total and fluorescent biological aerosol particles, which are particles determined to be biological in original based on their intrinsic fluorescent properties. The particle and microbial papers are recently published (and open access). As a short summary of our findings, the particle-based study showed a clear effect of occupancy level and activity on particle concentrations, and it was estimated that a person emits about 1 million fluorescent particles per hour. On the other hand, microbial composition indoors showed high affinity with a corresponding outdoor sample, and the effect of occupancy on these short 2-hour sampling periods was quite subtle. These paired results taken together are kind of puzzling — how can a person sitting at a desk be emitting about a million fluorescent biological particles per hour and yet that be practically unidentifiable in the airborne microbial composition? 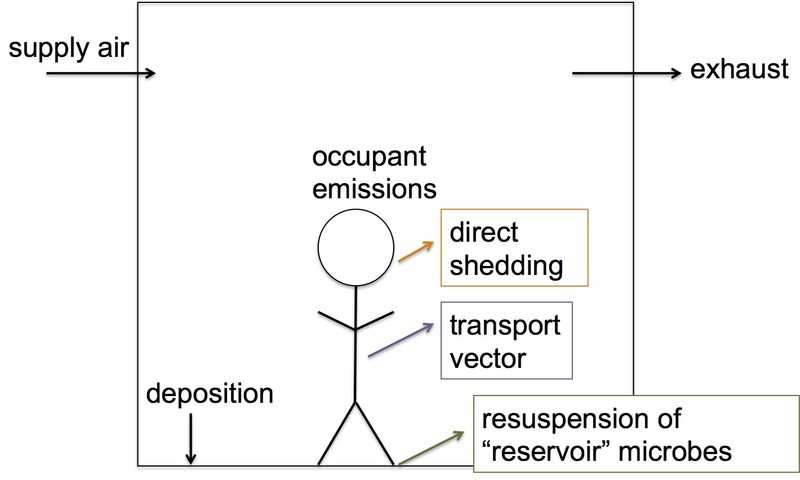 In thinking about what factors influence the indoor airborne microbial composition, we came up with a schematic that breaks occupant emissions into three parts: direct shedding, transport vector, and resuspension of reservoir microbes. Direct shedding comes from shedding skin and spitting, for example. A peculiar pattern involving a puffball showed the potential for humans to act as transport vectors for particles we’ve picked up in the environment (details in the paper). As for the resuspension of reservoir microbes, the study chamber we used undergoes long periods of low occupancy, and it could be that an environmental, rather than human, signature has built up in the room. Perhaps it was this environmental reservoir that got resuspended when people occupied that indoor space during our experiment, leading to a large generation of biological particles but a microbial signature that compositionally resembled outdoor air. As I said, it’s our working hypothesis, and we are pursuing projects to explore further. 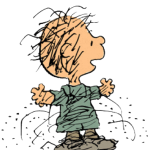 Maybe Charles Schulz’s Pigpen — a sort of particle-laden wildebeest never quite getting free of a debris cloud — is a good model for how humans influence the indoor air environment. Rachel Adams is a Project Scientist at University of California Berkeley.